As you can see, bento cups come in loads of different shapes and sizes. Sadly, all those cute patterns you see inside get hidden once you pack your bento box, so, although it’s hard, try not to select your cups on the basis of the bottom! Much better is to look at the top centimetre of the edge, as this is usually all you’ll see of your bento. When it comes to types of bento cups, there are five main kinds. There’s your standard paper bento cup which has a wax/plastic lining to stop food leaking. You need to throw these away after you’ve used them though, which is a shame. There’s your silicone bento cup which is actually heat proof and reuseable, which are massive bonuses – however, the drawback is that they don’t have patterns on them and are always solid colours. They will bend to the shape you want them to – within reason – so they’re very handy for slotting into your bento. There’s hard, rigid plastic cups which usually come in a particular shape, like a tulip flower or an elephant head or something like that. They can be difficult to fit, and there’s the same drawback with silicone cups of not having patterns on them. Unlike silicone, they’re not heat proof, but you can reuse them. There’s also foil bento cups, which you can use to heat food in. They’re disposable and I’ve found also pretty flimsy. To be honest, I’d always rather go for a silicone cup than a foil bento cup, because they’re sturdier and reusable. 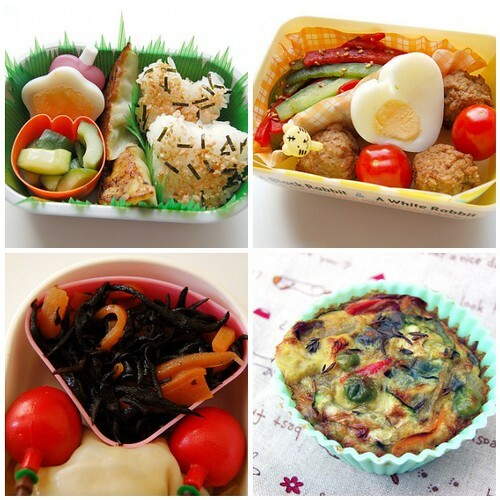 Then there’s your makeshift bento cups – the type you might fall back on if you can’t get hold of any bento supplies. 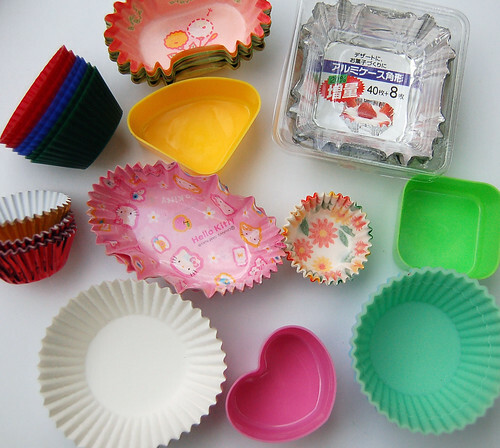 Cupcake and muffin cases make good substitutes, and you can get some really cute ones. However, unlike bento cups, if they’re going to have any kind of coating to prevent leaks, it’ll be on the outside of the cup, instead of the inside as with real bento cups. You should save cupcake and muffin cases for food which isn’t soggy at all. 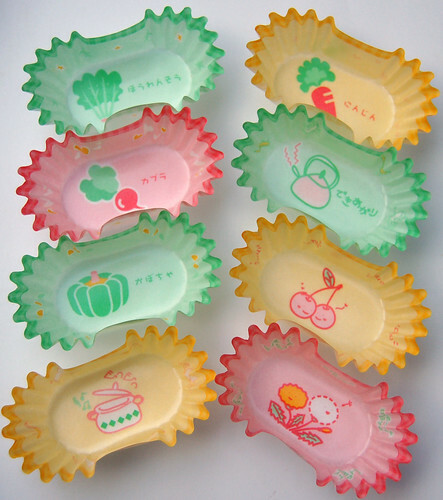 Here you can see some bento cups in action. The left hand side shows two rigid bento cups being put to good use on some soggy side dishes. Silicone would also do great here, but you can have mishaps with it sometimes as it’s so pliable. On the top right hand side, you can see a corner-shaped bento cup. See what I mean about the top edge? If you can, before you start packing, try to pick bento cups that match your bento box – whether it’s a complimentary colour or a contrasting one. It’ll definitely make a difference to the finished bento. On the bottom right, you can see a silicone cup which has been used to cook an omelette-type mix of eggs and veggies. Very handy things, silicone cups! Nice post, really informative! And that mini-omelet is cute. hehehehe…I like to buy all that stuff too!